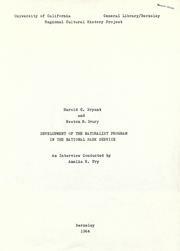 1 edition of Development of the naturalist program in the National Park S... found in the catalog. Add another edition? Are you sure you want to remove Development of the naturalist program in the National Park Service from your list? Published 1964 by University of California in Berkeley, Calif .
Interview of Harold C. Bryant and Newton B. Drury conducted 1964 by Amelia R. Fry for the Regional Cultural History Project, University of California Library, Berkeley. Photographs and snapshots inserted. Appended: Bulletin No. 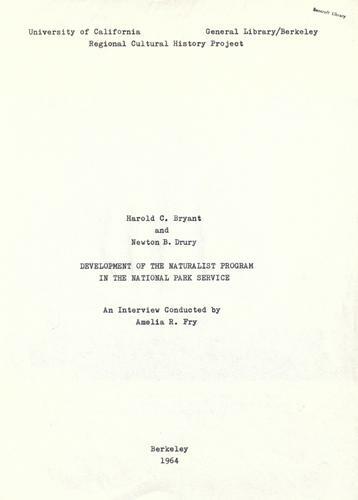 17 of The American Nature Association: Nature Guiding, by Harold C. Bryant. History of science and technology collection.